This intimate lodge offers guests a colonial style safari in the Sabi Sand Game Reserve, renowned for its Leopard sightings. 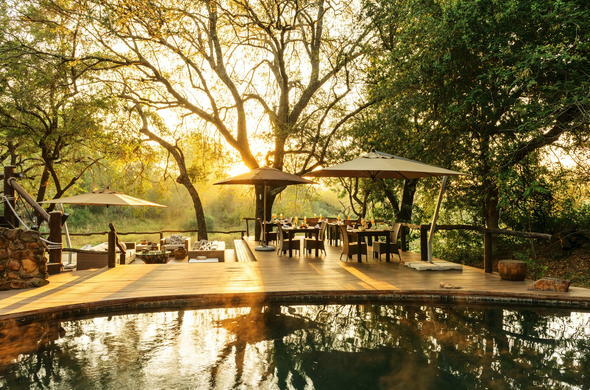 This intimate safari lodge has the unique colonial feel of an “Out of Africa” style safari that will thrill those looking for a traditional safari holiday in the renowned Sabi Sands Private Game Reserve. Dulini Lodge consists of six private thatched suites which are shaded by a grove of Ebony trees and sitauted on the banks of the riverbed. Each has its own viewing deck and private plunge pool. The lodge has a casual elegance and a warm African inspired decor. Set out on an early morning game drive, accompanied by your expert guide, who will help you track the Big Five. After breakfast, a bush walk offers a great opportunity for bird watching and discovering the smaller animals. In the evening you can enjoy a delicious African inspired meal out under the majestic Jackalberry tree. The lodge has a wine cellar with a collection of fine South African wines. Savor some of these fine labels around the pool, under the shade of the Leadwoods or during a sumptuous bush dinner. Don't slack on your fitness routine, the Dulini Lodge has well-equipped gym. A collection of fine African souvenirs are on sale at the curio shop. Game drives are conducted in open Land Rovers, in the company of experienced and skilled ranger and tracker.